The shimofuri gobies Tridentiger bifasciatus (Gobiidae: Gobionellinae), are small, benthic fish indigenous to the coastal waters of the West Pacific Ocean. In this study, 582-bp mitochondrial cytochrome C subunit I (COI) and 789-bp nuclear ryanodine receptor 3 (Ryr3) DNA sequence data were employed to evaluate population genetic structure of T. bifasciatus. A total of 14 distinct COI haplotypes and 14 distinct Ryr3 alleles were recovered for 140 samples collected from eight intertidal localities in the Zhejiang Coastal Sea, China. The indices of haplotype and nucleotide diversity within populations are 0.42–0.87 (Hd) and 0.13–0.54% (π) for COI and 0.26–0.59 (Hd) and 0.05–0.09% (π) for Ryr3. FST distances between population pairs are − 0.007–0.768 (COI) and − 0.030–0.311 (Ryr3). The south population of Cangnan exhibits significant divergence from all the north populations (p < 0.01). The median-joining (MJ) network indicates that one COI haplotype and one Ryr3 allele found in Cangnan are absent in all the north populations. This observation of phylogeographic break can be interpreted: (1) the dispersal of T. bifasciatus is driven more by small-scale local currents, including inflows of local rivers than by large-scale oceanographic currents; (2) the recruitment is frequently shared among the geographically proximate populations in the northern areas of Zhejiang Coastal Sea, whereas infrequently shared between Cangnan and geographically distant north populations. Tajima’s D statistics, star-like pattern observed on the MJ network, and mismatch distribution analysis present compelling evidence for pronounced demographic fluctuations for the overall population of T. bifasciatus, and infer that the species along the Zhejiang Coastal Sea has undergone a sudden expansion following bottleneck in the past, probably during the quaternary glaciations. 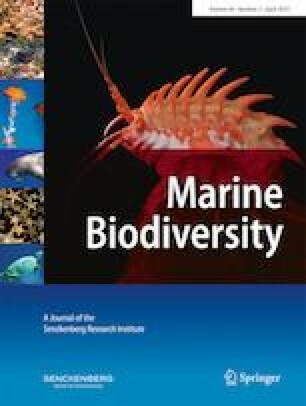 The central components for management efforts should occur with preserving ecological diversity and integrity, especially in areas with strong rates of economic growth and high degrees of artificial disturbance, as well as acknowledging separate management units for Cangnan and the other north populations of T. bifasciatus in the Coastal Sea. We thank Zetan Xu, Anqi Yan, Jamel T. James, and Yifan Wang (Zhejiang Ocean University) for their assistance in sampling and laboratory work. We also thank Michael Reuscher (Texas A&M University – Corpus Christi) and anonymous reviewers for their critical and insightful comments on the manuscript. The study was funded by the Scientific Research Foundation for the Returned Overseas Chinese Scholars, State Education Ministry of P.R. China (2014 to Yongjiu Chen) and the Start-Up Research Foundation of Zhejiang Ocean University (2011 to Yongjiu Chen).